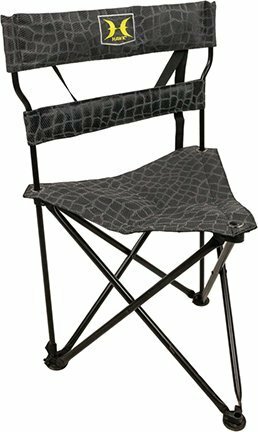 This lightweight, fold up tri-stool has a large seating area made up of a durable MeshComfort that offers no-pressure point relief. Wide back rest with added lumbar provides even more support while seated. Design allows for stealthy movement and doesn't restrict motion. Easy fold up with included sling.Seat height: 16"Seat size: 19"